Uncompressed 4K streaming, zero-latency AV-over-IP is the future of AV signal distribution. AV over IP is discussed so much in the commercial AV installation. It allows uncompressed audio and video signals over standard Ethernet network. This typically includes HD Video, Audio, Control Signals like IP, peripheral signals and more. AV over IP delivers scalability and flexibility that allows deploying AV infrastructure over Ethernet. Now that we are aware what AV over IP offers, the question is why it should be used? AV over IP offers great advantage when compared to legacy solutions, this include HD and UHD capabilities and zero- latency. Moreover, end-users have great ease of management while lowering down overall installation costs. Uncompressed 4K streaming, zero-latency AV over IP is the future of AV signal distribution. Arista’s IP Flash Caster allows installers and System Integrators replace proprietary AV matrix switches with off-the-shelf Ethernet networks that deliver high performance at an incredibly low price. Arista’s IP Flash Caster redefines the AV signal processing & distribution system and deliver single, cost-effective & scalable AV signal processing & distribution unit. IP Flash Caster is an end-to-end system for AV and KVM signal extension, IP-based switching, video wall and multi-view. It provide unique support for HDMI 2.0a, HDR, high-fidelity video scaling, windowing and audio down-mixing, broadcast quality scaling, visually indistinguishable light-compression, multi-source video compositing, video splitting, color space conversion, frame rate conversion, audio embedding/de-embedding, audio down-mixing and audio re-sampling. IP Flashcaster delivers multiple video viewing capabilities like multi-view, picture-in-picture (PIP) and picture and picture capabilities (PAP) within the AV signal distribution system. The multi-source video compositing capability allows each receiver to combine multiple video sources onto a single display enabling applications like multi-viewer, picture-in-picture and picture-and-picture. With 4K/60 capable compositing capability IP Flashcaster can tolerate a large number of asynchronous inputs and without tearing visual artifacts. In today’s world almost every industry require HD and UHD, AV equipment’s to communicate, broadcast, interact, collaborate & advertise. Dynamic digital displays are replacing static billboards and traditional printed signage mediums. While this trend has fueled exponential growth in the professional audio/video (pro-AV) market, the rapid change in consumer electronics technologies driving this growth continues to outpace the technical innovation. Pro-AV technologies are an essential building block for AV signal processing & distribution systems. 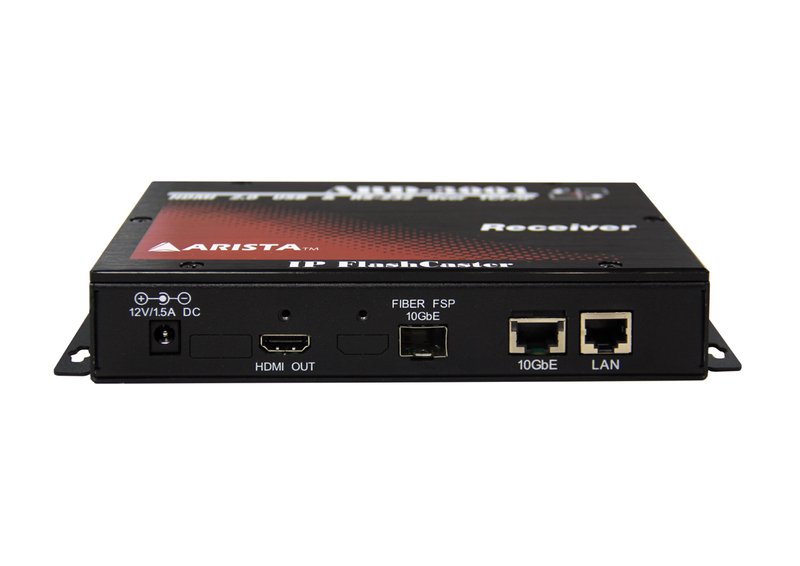 To know more about Arista IP Flashcaster click here and to check out Arista ProAV range click here. For any questions email sales@goaristacom or call our toll free number 1.877.827.4782 Monday through Friday 8:00am to 5:00pm PST.